PHOENIX– Only among a roster full of Pro Bowlers would J.J. Watt ever get chosen second. But when team captain Michael Irvin, a former Dallas star, won the coin toss and picked Cowboys running back DeMarco Murray, it meant his opposing counterpart Cris Carter got to select the Houston Texans’ defensive end. While the full Pro Bowl draft to divide Team Carter and Team Irvin is Wednesday night, the former NFL stars chose their captains Tuesday at the Pro Bowl kickoff press conference at the Arizona Biltmore. Carter also selected Pittsburgh Steelers wide receiver Antonio Brown, while Irvin took Cleveland Browns defensive back Joe Haden as their co-captains. The Pro Bowl is in its second year of the new fantasy draft-type format, abandoning the old conference vs. conference style. The captains said they will consider various things when choosing teams, such as chemistry. Case in point: Murray nudged Irvin and told him to take all the Cowboys, particularly Dallas’ three offensive linemen. “I definitely need to make sure those are our first three picks,” Irvin said with a laugh. The biggest criticism of the Pro Bowl was it was not a competitive football game. All-Star games are generally not the highest quality version of the sport, but in one as physical as football, the Pro Bowl proved to be a poor showing. The captains said they enjoy the current setup of the game, particularly the draft. It creates a fun but competitive atmosphere, the way an All-Star Game should be. They’re ready for Vincent’s challenge. The Pro Bowl Draft is Wednesday at the Arizona Biltmore. Pro Bowl practices are Thursday at Luke Air Force Base and Friday and Saturday at Scottsdale Community College. The Pro Bowl is set for 6 p.m. Sunday at University of Phoenix Stadium. And if you ask the players, it won’t be like past Pro Bowls. NFL Hall of Famers Michael Irvin and Cris Carter made their first selections in the 2015 Pro Bowl draft at the Arizona Biltmore on Tuesday. 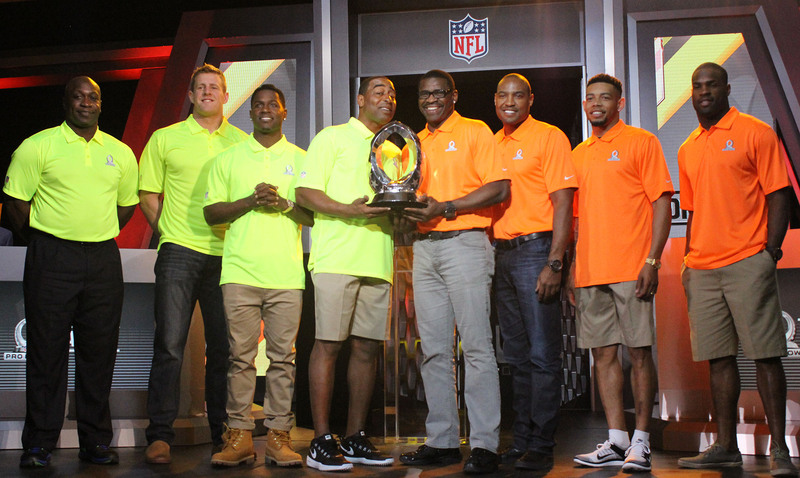 Captains Cris Carter, left, and Michael Irvin, right, pose with the coveted Pro Bowl MVP trophy surrounded by their first selections.